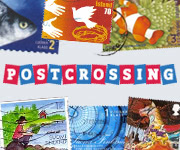 I have two new UNESCO sites, one from Ireland and one from Northern Ireland, both from Postcrossing forum member cursus_honorum. Skellig Michael is one of the Skellig Islands in the Atlantic Ocean and has been a UNESCO site since 1996. It is notable as the site of an early Christian monastery, founded sometime between the 6th and 8th centuries CE. The island remained occupied until the 12th century CE. The monastery is perched on the top of the island, which rises 714 feet (218 meters) out of the ocean. Shown here are the beehive shaped cells that were part of the monastery. The second card shows the Giant’s Causeway, part of the northeast coast of Northern Ireland. The coast is formed of about 40,000 columns of basalt rock, the result of an ancient volcanic eruption. Most of the columns are hexagonal, but some have more than six sides. The tallest columns are 39 feet (12 meters) tall. The Giant’s Causeway has been on the UNESCO list since 1986. On the left is a Europe stamp from 2013 showing a postal worker and his van. On the right is a stamp from 2014 showing a stained glass depiction of St. Patrick, one of the patron saints of Ireland.